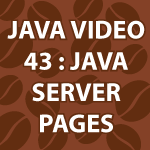 Here is part 1 of my Java Server Pages video tutorial. To completely understand everything you need to see my Java Servlet Video Tutorial. It sounds harder than it is and after this video you’ll be writing your own JSPs. The code follows the video to help you learn. I’ve a question out of this topic. Please don’t mind. Suppose i’ve made a static web site and i wanna hide my html, css code. is it possible? If yes then how is it possible? Please share. nice video, but when you are making videos for EL, JSTL, custom tags and all, because now a days scriptlet’s are obsolete.